If you are against slavery than this is the place to be. We are trying to find a way to overcome slavery and make it illegal. 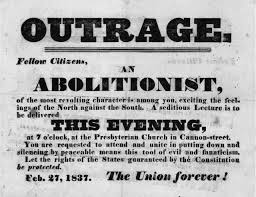 We will have debates on why is should not be aloud.additionaly, former slaves that have escaped throught the underground railroad will come and talk to us about how cruel and hard their lives have been. This will be a meeting mainly for debating if slavery shall be illegal.